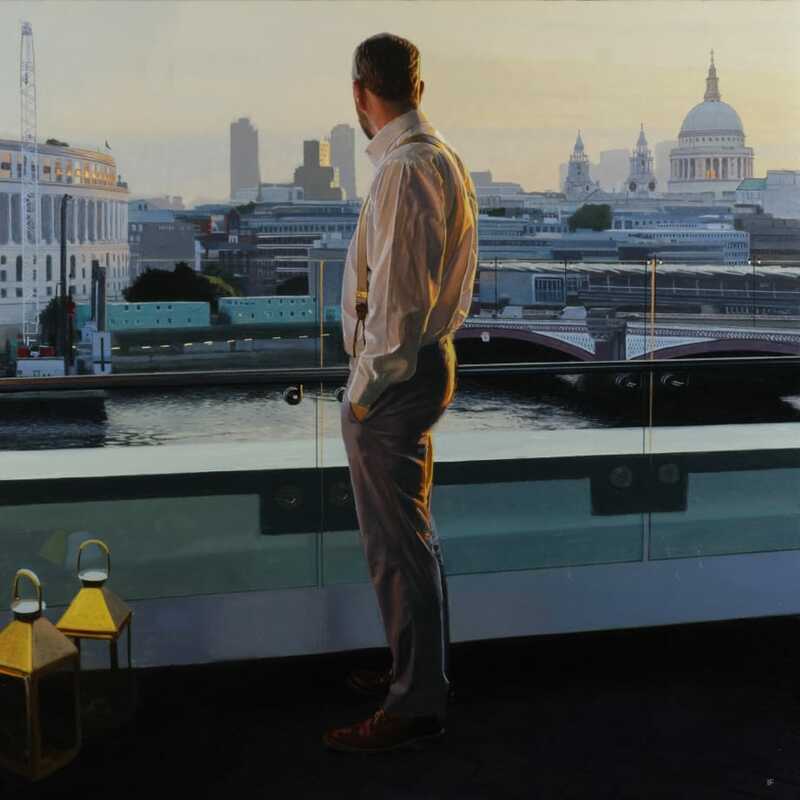 Scottish artist Iain Faulkner graduated from Glasgow School of Art in 1996 with a BA in Fine Art. He has had numerous solo shows in the UK, USA, France, Switzerland, Spain and Italy. His work appears in many private and corporate collections; in 2010 he was commissioned to paint the European Ryder Cup Team member portraits. His works feature a lone protagonist. Dressed uniformly in white shirt, black suit trousers and leather shoes, we see him paused between activities at a moment of reflection, pre-occupation or self-absorption. These scenes highlight moments of withdrawal and consolidation, where the subject turns inward. He appears rootless and world-weary, in transit in a hotel or at the wheel of a car or motor-boat. The images imply a sense of a nomadic existence. The fact that his face is obscured or turned away, allows us to see this figure as an everyman, a player both familiar and universal. The pictures are rendered in a highly-controlled, meticulously-realised representational technique, where skilful draughtsmanship and a masterful handling of light and shade combine to articulate the architecture, space and atmosphere. Faulkner deploys a cool palette dominated by bluish tones of black, grey and white to create calm detachment. The paintings abound in reflective surfaces: glass, polished chrome and painted metal refract, fragment and repeat. These images are romantic. They conjure ideas of modern-day, male heroes. Solitary and brooding, these figures suggest alienation, but also speak of autonomy and resilience. They bring to mind Caspar David Friedrich’s ‘Wanderer’ or ‘bandes dessinées’ characters and even Ian Fleming’s peripatetic Scot. There is a sense that these ‘illustrated pauses’ are strategic interludes where thoughts are ordered and decisions made before getting back into the saddle and re-joining the fray.